She gave us our BMI numbers, which is a silly number for individual fitness measurement, but I understand that it’s something that’s popular right now and customers may want and expect it. According to the handbook I was in the “average” category, which is essentially meaningless because this is BMI we’re talking about. Then we used little electronic devices to measure body fat percentage by zapping us with electricity that we didn’t feel. (BTW, these little dudes vary wildly in accuracy, though apparently the only truly accurate way to measure fat percentage is post-mortem.) 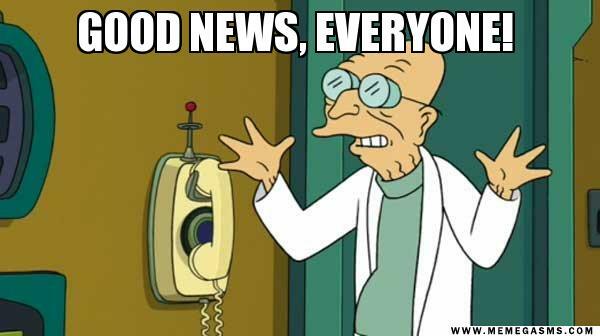 The nice assessment lady looked up my result and said, “Let’s see you’re in . . . very poor.” She seemed a little uncomfortable and said that often this is when people start getting upset. I wasn’t upset per se, but baffled. It seemed like there was a large variation of people whose bodies her handbook simply called “very poor.” This included someone like me, who benefits from thin privilege, to sumo wrestlers. WTF? Was this gym . . . negging me? Through the rest of the assessment, we found that various exercises and measurements were rated on the following scale: excellent, good, above average, average, poor, very poor. This scale makes sense for measuring how many push-ups you can do in a minute or how long you can hold a plank position, but it bothered me that it was used for BMI and body fat percentage. Would the nice assessment lady have to tell a skeletal person that their body was “excellent”? What even is average for body fat percentage? It looks like I won’t have an answer to either question. The first because I couldn’t bring myself to ask, “If I lose enough fat to stop menstruating will I be excellent?” The second because what is average and what is desirable depends on who you’re asking. None of the female athletes have percentages lower than 10%, despite the low end of the first table being 8%. 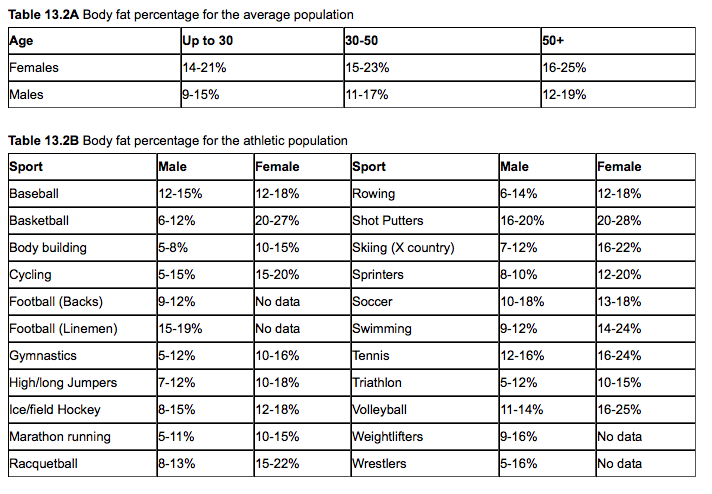 Moreover, they provide a table for “average” people showing that a woman under 30 should have less fat on average than female athletes in basketball, skiing, tennis, and volleyball. The numbers are all over the place! Tip of the hat for acknowledging essential fat is a thing and not saying that some people ought to have less than what they physically need. (Gosh, that’s a low bar.) 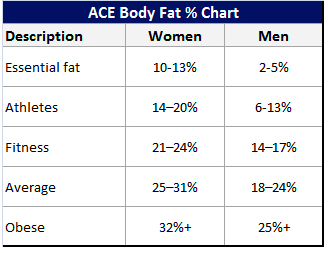 According to this table, though, there’s no gray area between average and obese. And while there are more reasonable sounding descriptors than “very poor” or “excellent” there’s still that preposterous fat percentage group called “athletes,” ignoring perhaps olympic weightlifters or professional baseball pitchers or ultra runners. I cannot do what those people can do; they are, by definition, athletes, regardless of body composition. My main takeaway from my internet digging, is that people love numbers. We want numbers to tell us that we’re acceptable or we have numbers in mind that will make us acceptable to ourselves. If you don’t believe me, look at the comments for any body building or weight loss site. People talk about where they are now versus where they want to be in numbers. I don’t necessarily want to get down on that. Especially for people in glamor sports like body building, you may already know what numbers you need to get the results you have in your mind. However, there’s a danger to making a single number or even an array of related numbers an indicator of overall health. Health and wellness are multidimensional, and maybe one person’s “poor” outcome is the best someone else has ever done. This is okay. Living, complex people can’t simply be divided by a handful of categories, even for just one aspect of our lives. In The Mismeasure of Man, Stephen Jay Gould delves into the history of mental testing, its faults and biases, and how it was used to make psychology more of a “hard science.” It seems to me, that many of our measurements for physical fitness are falling into similar patterns. The idea being, if you can put your hunches (Fat is bad. Have as little as possible. Hope you like shivering in movie theaters.) into numbers that you are measuring a real thing in a way that is scientific. But even from the small sample I encountered, different people are saying that these numbers mean different things. Just because you can measure body fat (and even that’s not truly accurate) doesn’t mean that it can be used as a measure of fitness. Ultimately, Mr. Squish and I did not join the snazzy, new gym. For a place that bills itself as a somewhere to build confidence and personal fitness, I felt like its brand relied too much on being what other people think is “acceptable.” I believe that the only measurement that matters is how you feel about yourself. Sometimes you’ll feel good and sometimes you’ll feel bad, but it should come from within, not from someone trying to sell you something. *I have had personal trainers before, and as a stretch goal I want to my personal trainer to teach me about professional wrestling and/or prisons and appreciate my wacky high school band anecdotes.